Fourth and last movement (Allegretto) of the Violin sonata in G minor (HWV 368, Op. 1 No. 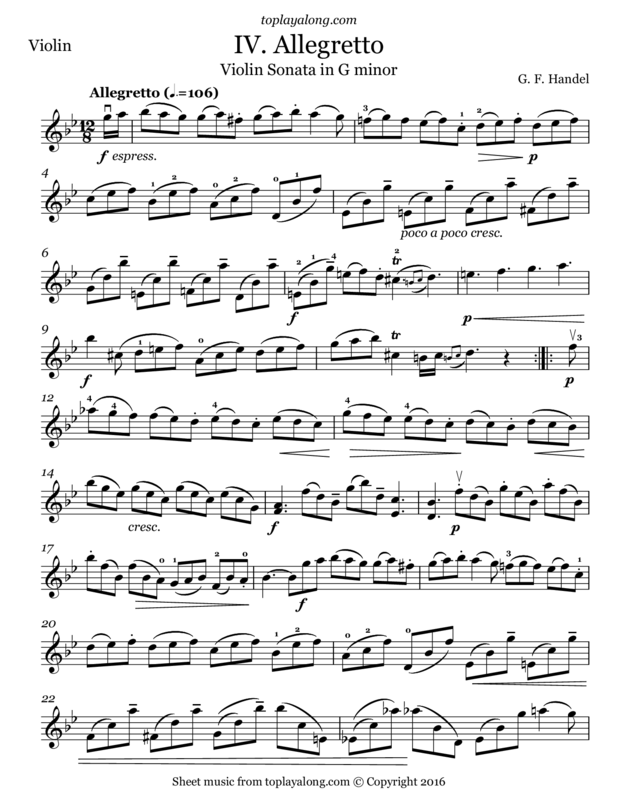 10), a work for violin and keyboard (harpsichord). The piece was originally thought to have been composed by George Frideric Handel. Modern scholars however believe it doubtful that the work was composed by Handel. The work is also referred to as Opus 1 No. 10, and was first published in 1732 by Walsh. Other catalogues of Handel's music have referred to the work as HG xxvii,37; and HHA iv/4,28. Both the Walsh edition and the Chrysander edition indicate that the work is for violin, and published it as Sonata X. In both editions, the tempo of movement four is unmarked (but appears to be an allegro, or similar).